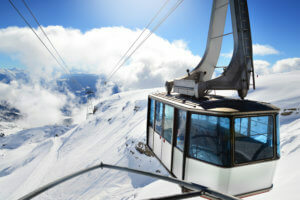 Although we touched on this briefly in our blog post: Which Ski Transfer is Best for You? – we though ski transfers for large groups deserved a bit more coverage. Group size is one of the most important factors when organising a ski transfer, and many people don’t realise the implications until it’s too late. If you are looking for ski transfers for large groups of friends, a couple of families combined, or just one larger family then that makes for a great holiday. In terms of ski transfers, 95% of private transfer companies across France, Italy, Austria & Switzerland tend to work with vans with 8 seats. This is largely because it is the largest number of passengers you can transport on a normal driving license. If you have 6 to 8 people in your group then you’re going to find that private ski transfers are the best option for you. Not only are they the quickest and most convenient transfer type, the economics of filling a vehicle are going to work in your favour as well. The costs for even the longest transfer journeys are going to be manageable when split between 8 people. This is by far the easiest way to do things – but just be aware that private transfer companies can get booked up quickly during busy times in the winter season. Often the best priced transfers will sell out months in advance. So, if you want to get the best deal we recommend that you search & compare ski transfer prices on Snowcompare.com well in advance. The choice is completely up to you – but here at Snowcompare we work with some great transfer companies like Snowbus, Simply Transfers and Le Praz Transfers who operate mini-coaches and provide ski transfers for large groups. We think it’s nicer if your whole group can arrive and leave together, but we can also provide pricing for two smaller vehicles, and for shared transfers too. Whichever choice you make on the transfer-type, you can rest assured that Snowcompare.com can save you time and money by showing you all the best private and shared transfer options on one page. Compare different transfer company prices, and even compare different options for passenger numbers on our easy-to-use website. If you’re a very popular person, or you’re organising a trip on behalf of a club or workplace then you will need to look at ski transfers by coach. These can actually work out very economical, but the per-person price will depend on your group filling as many seats in the vehicle as possible. Snowcompare has partners working with coaches for up to 50 people which will operate as a private transfer where required. 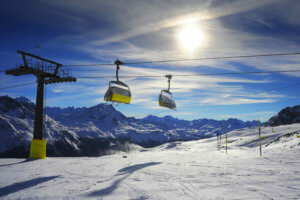 If you need ski transfers for large groups of skiers & snowboarders there is a suitable travel option out there for you. Snowcompare.com helps your search by putting all the best transfer companies on one website. This means you’ll spend less time searching the web for transport options, and you can be sure you’re getting the best deals on your chosen transfers.